Fitzwilliam Darcy is faced with a family crisis of epic proportions after the fallout of his sister Georgiana’s ill-fated elopement in Ramsgate, while his friend Charles Bingley is persuaded to abandon his scheme of renting Netherfield Park. Elizabeth Bennet journeys to London to recover her spirits, after Jane’s unexpected marriage changes the sisters’ relationship forever, and the consolation of the Gardiners proves insufficient. The bonds of friendship offer Elizabeth a lifeline after a series of tragic events causes her to fear for her future. The support she receives from her new neighbor Marianne Brandon, and snarky socialite Lady Rebecca Fitzwilliam prove she is truly happier in her friends than relations. As a reader of Jane Austen fanfiction, I never really warmed to Anne de Bourgh as a character. Though there have been a few truly fantastic exceptions, I am not typically drawn to stories that give her a larger role. Once I started writing JAFF, all that changed. I began to understand the value of a minor character with so much potential. The great thing about a character like Anne de Bourgh is that we know just enough about her to know that she is important to the story, while still leaving enough room for a wide range of interpretation. Anyone who is an avid reader of Austen variations will know what I mean: Anne is not as sickly as she seems, Anne is secretly playing matchmaker, Anne gives Lady Catherine the telling-off she deserves. Occasionally, she is just as dreadful as her mother. Often, Anne marries Richard Fitzwilliam. Or perhaps she is Mr. Darcy’s long-dead first wife. Sometimes, she just conveniently dies. Having Anne as essentially a blank canvas to further the story might sound a lot like cheating, but I like to think of it as her out-Catherine-ing her own mother, who we all know is so eager to be useful to others. While Anne wasn’t much help with the shelves in my closet, she was tremendously useful in shaping the earliest plans for my novel as the story began to take shape in my mind. 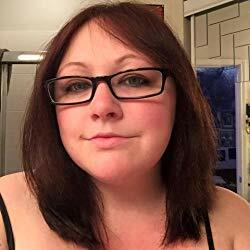 What I had planned for her was something that I wanted to shock the reader, and the role that I meant for her to play was the foundation for what spiraled into a complicated and compelling family saga. Though Anne’s role in Happier in Her Friends Than Relations is significant, it is also brief, with her only having dialogue in one chapter, and it was a blast to write! Darcy starts out on good terms with Lizzy, so I thought that perhaps it might fall to his cousin to call him out for his “selfish disdain for the feelings of others,” and give him the wake-up call he still needs, even though Lizzy doesn’t despise him. I have included an excerpt of Anne’s chapter below; the book is available on Kindle, and you are invited to enter for a chance to win a free copy of the ebook! Darcy regarded his wife for some time, ruminating in his own recollections as a familiar silence settled over them. It was precisely for this reason that he had long dreamed of a different kind of marriage. The kind Charles would soon make. A marriage of love to a woman full of life, a woman who would bear him true children and fill his home with laughter and light. Instead, he had this. An unconsummated sham, a woman who would likely not live long enough to hear his sister’s child call her Mother. Again Anne stroked her padded belly in silence. A pang of guilt pierced Darcy’s heart as he wondered if perhaps she had adopted the gesture from an unconscious desire to truly bear a child. Darcy grimaced. Georgiana had left Pemberley in October—ostensibly to travel with friends while her brother settled into married life. In reality, Georgiana had been sent to spend the rest of her confinement with her new companion, Mrs. Annesley, in a remote seaside village near Frodsham in Cheshire. They had not parted on the best of terms. Darcy knew his sister had never intended her family to go to such great lengths to conceal her mistake, and yet despite her professions of remorse, there had been no real contrition. Her condition, and perhaps the years of isolation, had rendered her contentious and overly emotional. Much as it pained him, it had been easier to simply send her away. A derisive snort was all the reply he received. Anne crossed her arms and glowered at him. Darcy felt as if she had physically stuck him. “So, this is your opinion of me! This is the estimation in which you hold me! Thank you for explaining it so fully.” He stalked across the room and meant to leave, when another fit of coughing overtook his wife. He hesitated and heaved a great sigh, knowing he was being unreasonable, and turned back to her. Anne tried to push him away, even as her knees buckled and she collapsed into his arms. Darcy ignored her protestations and carried her over to the sofa nearest the fire. He pulled her shawls up around her shoulders and cupped her cheek in his hand, tilting her face towards him, though she would not meet his eye. There was a little spattering of blood at the corner of her mouth. Dabbing it away with his handkerchief, Darcy felt his anger fade into guilt and shame. What had she said that was not the truth? He deserved it all, and more besides. This book is available to buy in ebook and paperback now. It's also available in Kindle Unlimited on some Amazon sites. 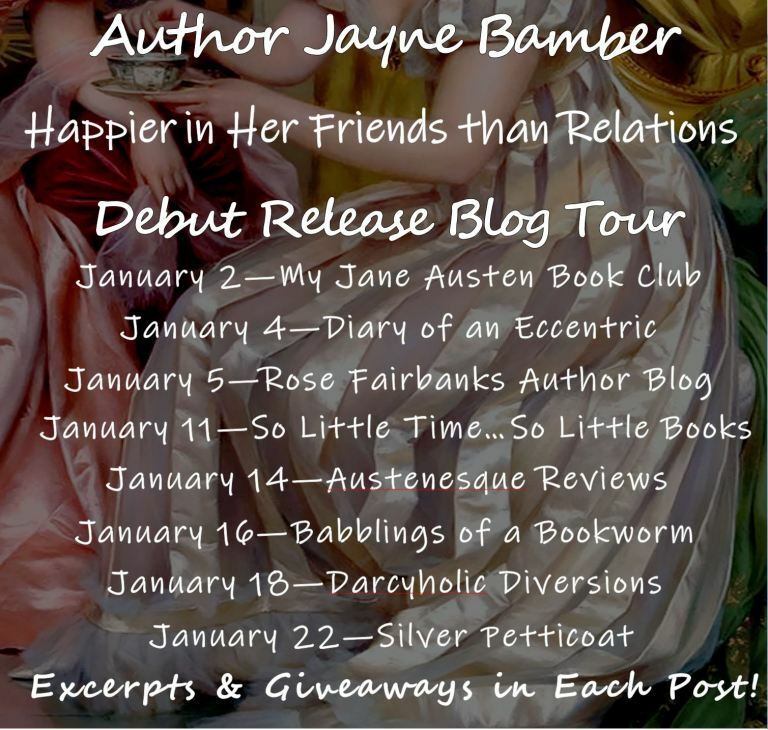 Jayne Bamber is a life-long Austen fan, and a total sucker for costume dramas. Jayne read her first Austen variation as a teenager and has spent more than a decade devouring as many of them as she can. This of course has led her to the ultimate conclusion of her addiction, writing one herself. Jayne's favorite Austen work is Sense and Sensibility, though Sanditon is a strong second. 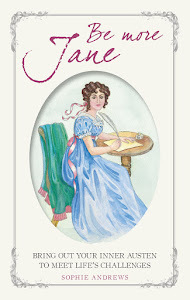 Despite her love for Pride and Prejudice, Jayne realizes that she is no Lizzy Bennet, and is in fact growing up to be Mrs. Bennet more and more each day. After years of dating Wickhams, Collinses, and the occasional Tilney-that-got-away, Jayne married her very own Darcy (tinged with just the right amount of Mr. Palmer) and the two live together in Texas with a pair of badly behaved rat terriers, and a desire to expand their menagerie of fur babies. As an aside, this author bio made me smile. I thought it was only me that liked grumpy Mr Palmer! 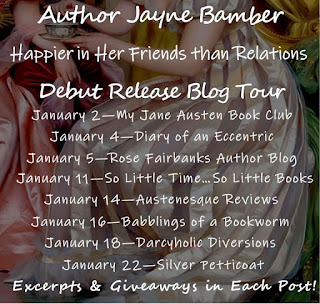 Jayne Bamber is kindly offering to give away an ebook of Happier in Her Friends Than Relations to a visitor to Babblings of a Bookworm. To enter, just leave a comment on this blog post by the end of the day on Friday 25 January. This is open to international entrants. Please leave a way for me to contact you, or follow the post and I'll let you know in the comments when the winner has been posted. Jayne is visiting other blogs too. Here's a list of where you can find the posts. Hi Vesper. For me a Darcy and Elizabeth HEA is an absolute must, so although I don't mind Anne, unfortunately she has to die if she's married Darcy! This sounds like such a great book! I think you will have many happy readers. Thanks for the giveaway! I like the premise of this one too, Danielle. Glad you enjoyed it Darcybennett. Good for Anne! Good for you! Congratulations if I haven't said it before. Personally, I love secondary characters being developed and given their time to shine. It's good to see Anne de Bourgh and Georgiana Darcy fleshed out further isn't it, Carole. I am one who needs a HEA for ODC so I would be interested in reading how this one ends up. Thanks for a chance to win. And Thanks for sharing the excerpt. I am with you 100% Sheila! Yikes. 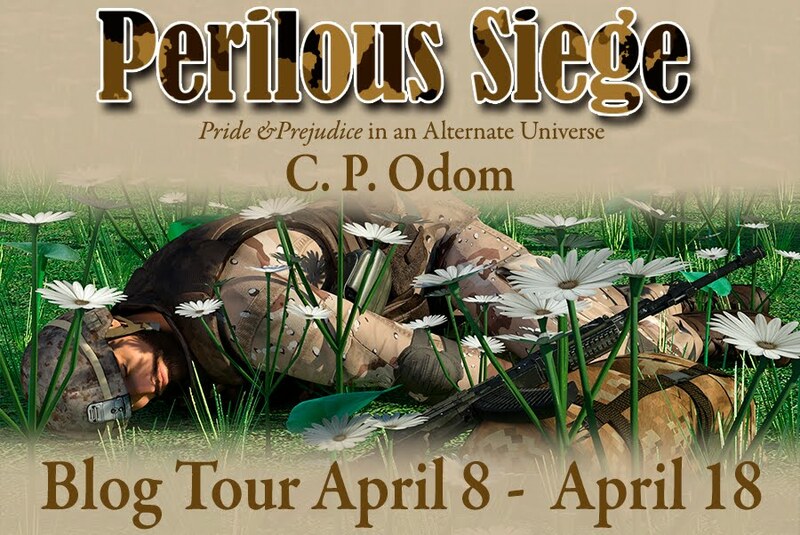 I feared I will have read too many excerpts by the end of this blog tour, yet I was really eager to read this one. So far, the excerpts I've read, which are fantastic, seem to be scattered through the book and haven't really given away too much of the story. Just enough to make me want to read this ASAP. Thank you so much for the giveaway opportunity. Best luck in your writing career, I'm eager to follow you. So glad you enjoyed the excerpt, Michelle. It was an exciting one! I love this Anne, she is so thoughtful and understanding. If it wasn’t for Darcy and Elizabeth ‘s HEA, I’d love this Anne to be Darcy’s lifelong companion. Thanks for the giveaway and congratulations on the release. I loved the excerpt! How refreshing to see Anne stand up to Darcy. Thanks for the chance to win a copy of the book! She's a feisty one isn't she! Anne and Darcy married. This takes quite a turn. I will be sorry to see this Anne killed off. I am eagerly anticipating reading this book. I'm quite sorry about it too!